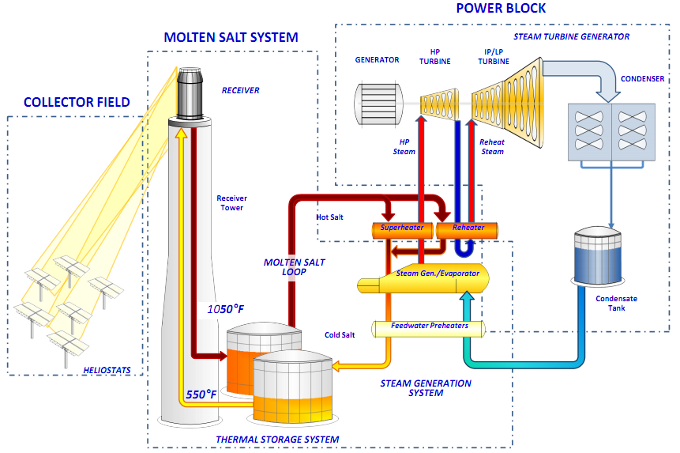 A couple of solar articles from the US describing plants about to be built using molten salt heat storage to extend or shift the generating ability of the solar thermal plant. Abengoa's $2 billion Solana plant is expected to be the first major stored-heat plant in the U.S. when it enters service in 2013. Some already exist in Spain and a few more are on the drawing board for Nevada and California. On Dec. 21, Abengoa, a unit of Spanish utility company Abengoa SA, cleared a major hurdle when it announced it received a $1.45 billion U.S. loan guarantee for the 250-megawatt Arizona project, planned for a site 70 miles southwest of Phoenix near Gila Bend. Such utility-scale solar plants use mirrors to focus the sun's rays on a liquid, contained in tubes, which can be heated to very hot temperatures. The liquid is used to boil water and create steam. By using a conventional steam-turbine generator, electricity is produced. But the twist is that the Arizona facility will have two giant salt tanks, each 122 feet in diameter and 34 feet deep, that together can hold and store 40% of the heat created by the plant. Such storage technologies are expected to become more commonplace in the U.S. at solar plants as officials try to limit the release of carbon dioxide from fossil-fuel power plants and make renewable power production more dependable. [M]olten salt storage systems add about 20% to the construction cost of solar plants but more than make up for it by boosting a plant's flexibility and productivity. The study found that solar electricity was more valuable, though, because its output was more correlated to peak electricity demand. Still, experts say that unless costs come down, the number of solar projects that get built will be limited. SolarReserve LLC, a power development company in Santa Monica, Calif., is working on two solar projects in Nevada and California that will have even more heat-storage capacity, relative to their size, than Abengoa's project. These plants will put out 110 megawatts and 150 megawatts in electricity, respectively, and will be able to store enough heat to run eight to 12 hours without additional sunlight. SolarReserve has power sales agreements with NV Energy Inc. and PG&E Corp., and expects to have the two plants in service by 2014. Each will cost $650 million to $750 million. The U.S. National Renewable Energy Laboratory, part of the Department of Energy, says molten salt storage is "proven technology." "When you put heat into one of these tanks, you get 95% or 96% of the heat back out again," said Mr. Mehos, at the federal energy lab. "It's a nice big Thermos." California has approved a molten salt solar reactor project. The plan is for a 150-megawatt solar power tower project. From the press release: the “Solar Energy Project has the ability to collect and store enough thermal energy each morning to operate at full power all afternoon and for up to 8 hours after sunset. [H]eliostats focus concentrated sunlight on a receiver which sits on top of the tower. Within the receiver, the concentrated sunlight heats molten salt to over 1000 degrees Fahrenheit. The heated molten salt then flows into a thermal storage tank where it is stored, maintaining 98% thermal efficiency, and eventually pumped to a steam generator. The steam drives a standard turbine to generate electricity. This process, also known as the “Rankine cycle” is similar to a standard coal-fired power plant, except it is fueled by clean and free solar energy.